This tour departs from Central Amsterdam at 9.30 am and returns at 19.00 (approx.). This tour can be taken at any time. We are comparing Holland in One Day Tour from Amsterdam Prices from leading ticket suppliers and Try to find you Cheap tickets prices on the market. This is the perfect tour for anyone who's looking to see a little of the ‘real' Holland, ready to delve into the country's political, historical and trading centres or find out how the tradition of making blue and white earthenware pottery began and developed. This full day tour departs from Central Amsterdam in the morning. On the road of Rotterdam you'll catch glimpses of the charming Dutch countryside, listen to facts and fables from your onboard guide. In Rotterdam you'll have time to city's famous landmarks, including the Euromast, before driving to Delft to visit an original 17th-century pottery workshop, Royal Delft or Delft Blue Pottery Factory. Stop to take photos of the Peace Palace on your way to the Hague where you can learn all about Dutch politics and history on a walking tour past the King's residence and the Houses of Parliament. 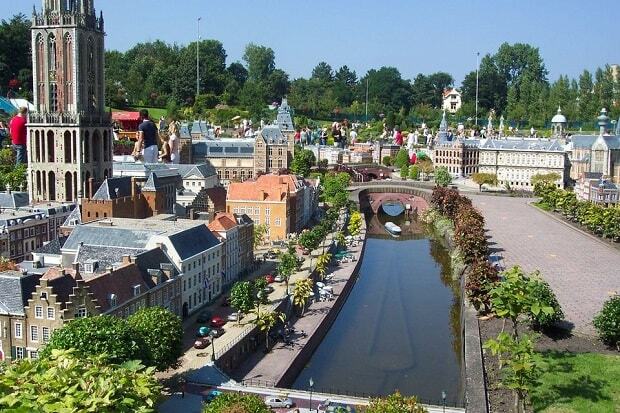 The last stop on your tour of Southern Holland will make you feel like a giant as the Madurodam Miniature Park is a mini maze of Holland's most significant historical sights and landmarks. The coach will return to Central Amsterdam in the evening, where you can take advantage of a free 1 hour Canal Cruise. This tour is aimed at people who want see a little more of Holland. Visitors interested in history, culture and sightseeing will enjoy this tour. A hassle-free option for travellers who want to save time and see a lot in one day. Suitable for families but children may find the tour a little tiring. Your Experience With Holland in One Day Tour from Amsterdam? Explore Southern Holland from a comfortable coach with a professional and knowledgeable guide. Climb the Euromast Tower in Rotterdam for views of one of Europe's largest harbours. See how Delft Pottery is made an original 17th-century earthenware factory, visit the Dutch houses of Parliament in The Hague as well as other city landmarks, and stop by Madurodam Miniature City. Return to Central Amsterdam and take a complimentary 1 hour Canal Cruise. What Holland in One Day Tour from Amsterdam Includes? Entrance to the Euromast and guided walking tours of the Rotterdam and The Hague. Entrance to the Royal Delft/Delft Blue Pottery Factory and Madurodam Miniature Park. Free 1 hour Amsterdam Canal Cruise with multilingual audio guide. Central Amsterdam – drive to Rotterdam – walking tour and Euromast – visit a pottery workshop in Delft – walking tour of The Hauge – visit Madurodam Miniature Park – return to Central Amsterdam. Travelers Reviews about Holland in One Day Tour from Amsterdam? This tour has 4.3-stars from reviews posted on Get Your Guide website. On Viator and TripAdvisor the Holland in One Day tour has 4.5 out of 5-stars. Travellers say that this is an excellent trip for seeing other parts of Holland. Comments agree that the bus journey is very enjoyable and perfect if you only have a short time in the Netherlands. Coaches are wheelchair accessible but wheelchair user will need to be accompanied by assistant. If cancelled less 7 days in advance fees may apply. You must arrive at the meeting point 30 minutes prior to departure time. Food/Drinks are excluded from ticket price.